Multi-display environments (MDEs) connect several displays into a single digital workspace. One of the main problems to be solved in an MDE’s design is how to enable movement of objects from one display to another. When the real-world space between displays is modeled as part of the workspace (i.e., Mouse Ether), it becomes difficult for users to keep track of their cursors during a transition between displays. 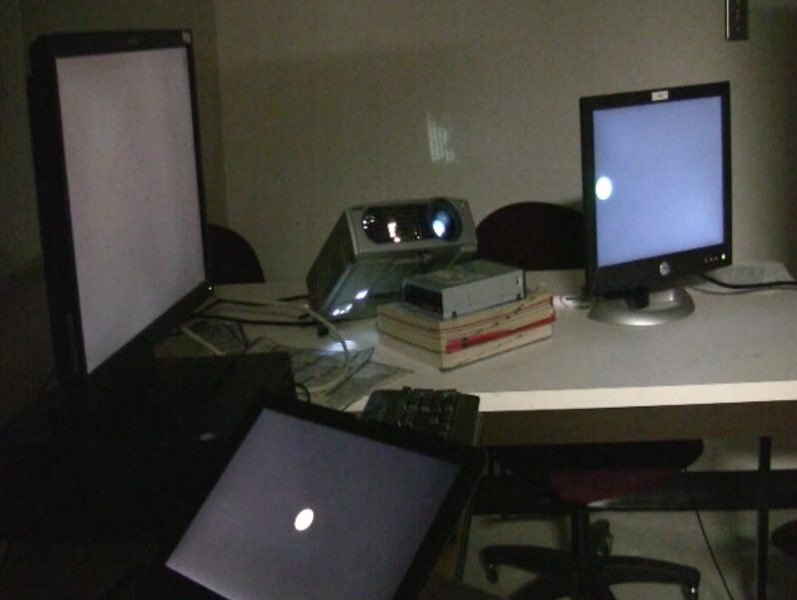 To address this problem, we developed the Ubiquitous Cursor system, which uses a projector and a hemispherical mirror to completely cover the interior of a room with usable low-resolution pixels. Ubiquitous Cursor allows us to provide direct feedback about the location of the cursor between displays. To assess the effectiveness of this direct-feedback approach, we carried out a study that compared Ubiquitous Cursor with two other standard approaches: Halos, which provide indirect feedback about the cursor’s location; and Stitching, which warps the cursor between displays, similar to the way that current operating systems address multiple monitors. Our study tested simple cross-display pointing tasks in an MDE; the results showed that Ubiquitous Cursor was significantly faster than both other approaches. Our work shows the feasibility and the value of providing direct feedback for cross-display movement, and adds to our understanding of the principles underlying targeting performance in MDEs. Xiao, R., Nacenta, M., Mandryk, R.L., Cockburn, A., Gutwin, C. 2011. Ubiquitous Cursor: A Comparison of Direct and Indirect Pointing Feedback in Multi-Display Environments. In Proceedings of the 37th Graphics Interface (St. John’s, Newfoundland, Canada, May 25 – 27, 2011). GI ’11. Canadian Human-Computer Communications Society, Waterloo, Ontario, Canada. 135-142.